A pair of Aaron Rodgers' favourite targets are visiting potential new teams. Former Green Bay Packers wide receivers Randall Cobb and Jordy Nelson are meeting with teams over the next 48 hours with Cobb visiting the Dallas Cowboys on Monday, reports ESPN's Todd Archer, while Jordy Nelson is set to meet with the Seattle Seahawks on Tuesday, according to ESPN's Adam Schefter. Cobb, 28, has spent his entire eight-year career with the Green Bay Packers after being taken with a second-round pick out of Kentucky in 2011. A native of Maryville, TN, Cobb appeared in nine games last season for the Packers, recording 38 receptions for 383 yards and two touchdowns. 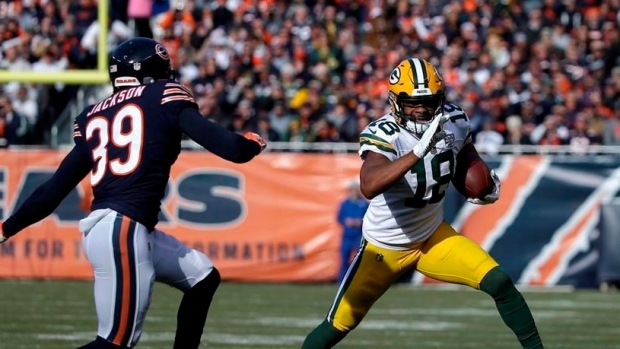 Cobb was a Pro Bowler in 2014, the year he recorded his best ever season as a pro, registering 1,287 yards receiving on 91 receptions and 12 touchdowns. The Cowboys could see Cobb as a slot replacement for the departed Cole Beasley, who signed last week with the Buffalo Bills. Nelson, 33, spent the first nine seasons of his career with the Packers before spending last season with the Oakland Raiders. A native of Manhattan, KS, Nelson appeared in 15 games for the Raiders last season, recording 739 yards receiving on 63 catches and three touchdowns. Nelson has posted four seasons of 1,000-plus receiving yards, including a career-best 1,519 in 2014, and led the league in TDs in 2016 with 14. Schefter notes that the New England Patriots, Tennessee Titans, Kansas City Chiefs and the Raiders remain interested in Nelson's services.